Sunbeam Estates section of Breckenridge, Summit County, Colorado. Five bedrooms, five and one-half baths, and family room with sleeper sofa. Sleeps 12 comfortably. Completed in 2001, this residence is built on a half acre lot in Sunbeam Estates, one of Breckenridge’s most exclusive and quietest neighborhoods. Breckenridge is located in Summit County and is close to Vail, Copper Mountain, and Keystone ski areas. The house is secluded, yet located right in the town limits. Our home is an eight minute walk from Main Street shopping and dining, five minute walk to the town park and public tennis courts, a two minute walk to the town's indoor/outdoor ice skating rink and a two minute walk to the town ski shuttle, which stops at all major lifts. The great room windows and master bedroom window have full view of the ski area. This home has log-accented, vaulted ceilings and is built on three levels with radiant-heated floors. All five bedrooms are furnished with their own private bathroom, cable TV/DVD, and telephone. Three bedrooms have their own private deck. The top level includes the master bedroom (queen-size bed), private deck, and bathroom outfitted with granite counter, jetted tub, and steam room/shower. The main level includes two separate bedrooms/baths (queen-size beds) each with private deck, laundry room (washer/dryer), and a great room which has a stone fireplace, 32-inch TV, DVD, and stereo entertainment center. The kitchen is equipped with Sub-Zero refrigerator, two Dacor ovens, breakfast counter, hot-water dispenser, dishwasher, and kitchen appliances. There is seating for ten at the dining room table and four people at the breakfast bar. The outdoor deck off of kitchen on main level has Broil Master gas barbecue grill. The lower level is a garden-level floor with lots of light, and contains two separate bedrooms/baths (each bedroom is fitted with two twin beds;one bed has extra trundle pull-out, so three can sleep in room.) The family room has a DVD,TV/VCR and sleeper/sofa, mudroom, and heated two-car garage. The sliding patio door opens to a Hot Spring brand, hot tub which seats six adults. ABSOLUTELY, NO PETS OR SMOKING ALLOWED. NOTE: We request a minimum stay of five nights during summer/ski season and five nights during Christmas/New Year's. Taxes are included. Fifty percent fee is due at time of reservation; remainder is due 45 days prior to arrival with additional refundable security deposit. Weekly rates include 10% discount. All linens and towels are provided. A one-time additional cleaning fee of $150 applies to all rentals. Interim maid service is available and OPTIONAL at a cost of $100 per cleaning. Fully equipped kitchen 2 sinks; cooktop and island seating. (7) Television in all great room, family room and all bedrooms. DVD player in great room. Bicycle rentals located throughout Breckenridge commercial district. Boating Marina and kayak, canoe, sail, power boat services located at nearby Dillon Reservoir. House is located conveniently within 60 minutes driving distance or less to 7 ski areas including Breckenridge, Keystone, A-Basin, Copper Mtn. Winter Park, Vail, Beaver Creek. Indoor/outdoor tennis facilities located at Breckenridge Recreation Center. 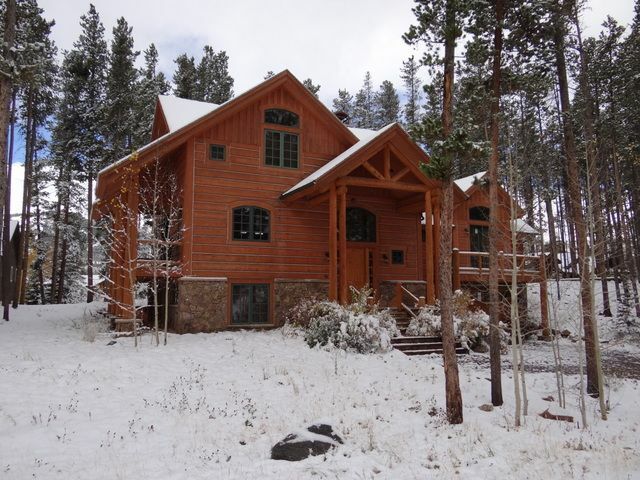 House is located close to Breckenridge, Keystone, Copper Mtn. Vail and Beaver Creek Golf courses.